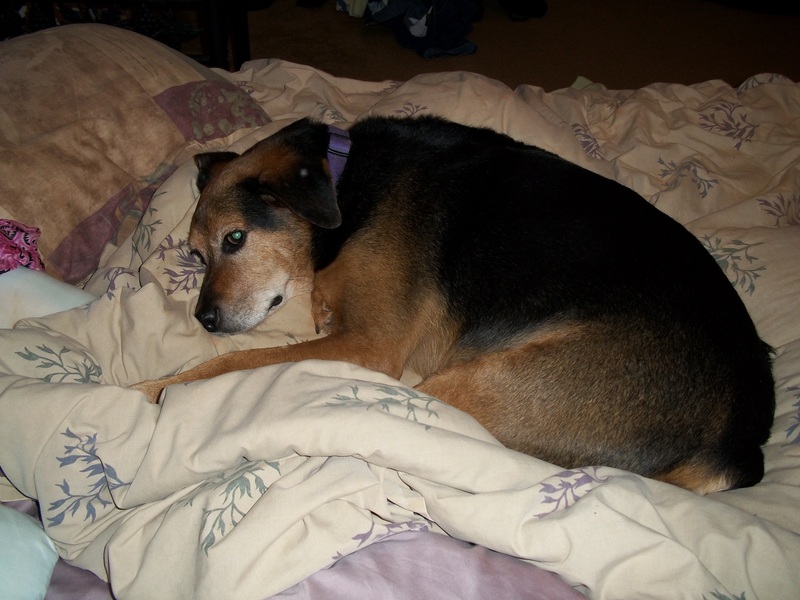 I miss snuggling with ZGirl! Dudley and Zoe loved to play in the snow. 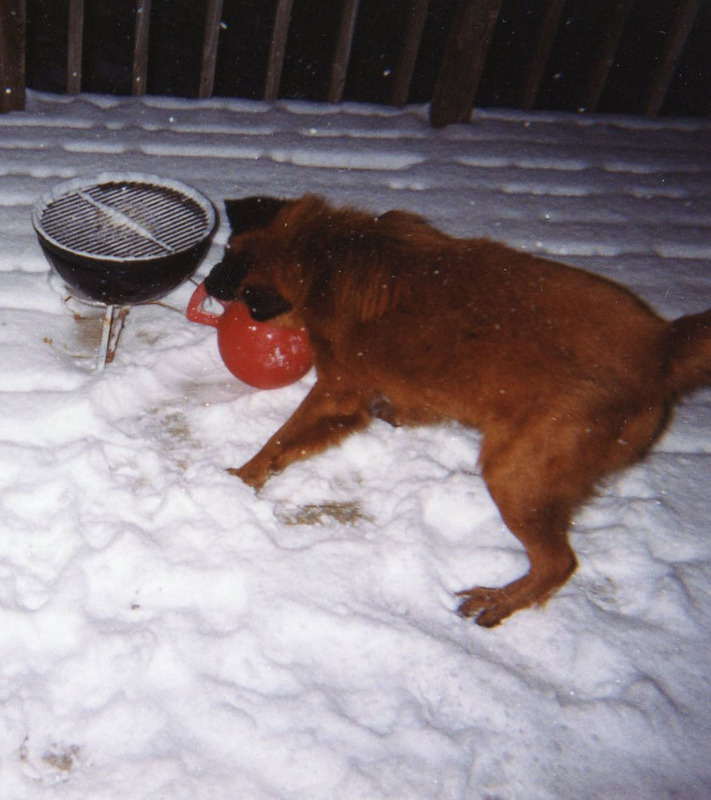 The pictures below of Dudley are from January 2000 about a week before 22″ of snow fell in the area. I hate I wasted the last of my disposable camera film on the mere inch or two we had but who’d have thunk we would have record breaking snow a week later? I don’t have pictures, but Dudley was a hoot when he first went out in it. The snow was up to his neck but light and fluffy and he cut about 10 trails to all different places in the yard. He was so excited! 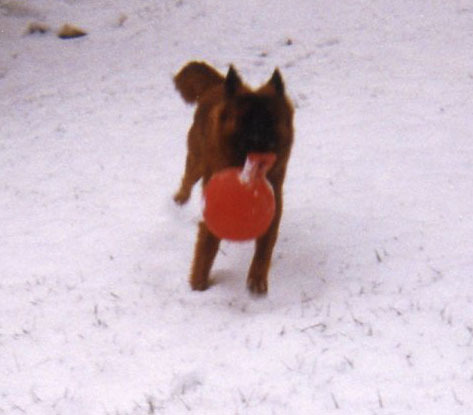 Dudley loved to play with the jolly ball. Jolly balls are made of this tough plastic and are supposed to be indestructible, but once Zoe got hold of it, the jolly ball’s days were numbered. Zoe chewed the handle off of it and I nicked it with the lawn mower and that’s what happened to the red jolly ball the first summer Zoe lived with us. So, the next Christmas I was looking around Raleigh for a new jolly ball, but couldn’t find one. I had bought the first one online, so I ended up getting the second one online, too. That same day I stopped in the flower department of the local grocery store and asked the man if he had any baby’s breath for my Christmas tree. He must have been working at the Harris Teeter to hone his stand-up comedy act, because our comedian put his hand over his mouth and nose, huffed a big breath and said, “no.” In one of those rare moments when the Fates actually allowed me the perfect retort at the perfect time (I usually think of the perfect come back 3 days later in the shower) I replied, “you should’ve been in the last store when I asked the man if he had jolly balls.” It really happened. I swear to Dog. This entry was posted in Uncategorized and tagged animals, blizzard of 2000, canine, Dudley, Harris Teeter, January, Jolly Balls, Zoe. Bookmark the permalink. Such great memories of Dudley and Zoe. And I love what said to the man in the flower department!